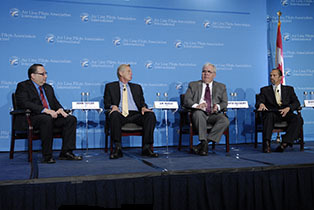 August 7, 2014 - A distinguished panel of aviation medicine experts discussed a wide range of current aeromedical topics during a panel, “Pilot Health and Occupational Safety,” held last Thursday afternoon at the ALPA Air Safety Forum in Washington, D.C.
“Capt. John Taylor (ExpressJet), ALPA Aeromedical chairman, moderated the panel made up of Dr. Jim Fraser, FAA Federal Air Surgeon; Dr. David Salisbury, director of Medicine, Civil Aviation, Transport Canada; and Dr. Quay Snyder, ALPA Aeromedical advisor. Acknowledging that FAA policy on obstructive sleep apnea (OSA) is “the elephant in the room,” Fraser announced that the FAA has developed draft policy on OSA that has “addressed the concerns of ALPA and other stakeholders.” Those concerns arose last autumn when Fraser’s predecessor as Federal Air Surgeon, Dr. Fred Tilton, published an editorial in an aeromedical journal outlining an FAA proposal to require automatic OSA testing of all airmen above a specific Body Mass Index (BMI) regardless of other physical characteristics or symptoms. In response to a question from the audience, Salisbury said “CPAP [continuous positive airway pressure, delivered by a small, portable machine] is the gold standard” for treating snoring and OSA. In March 2013, the FAA embarked on a major change in its handling of electronic applications and records; the result had the unintended effect of greatly increasing the time FAA needed to process applications for medical certificates. Fraser replied, “I would like to urge every pilot to give us the information we need, up front. Right now, about 92 percent of pilots walk out of their AME’s office with their certificate in hand. I would like to raise that number.” Salisbury added, “What you’re talking about is ‘proactive disclosure’—you need to give us the information we need so we can help get you back in the air, or stay in the air." Taylor observed that, in the United States, diabetes is on the rise, but that Canada and the United States handle medical certification of diabetic pilots differently. Snyder indicated that the testing requirements and costs associated with SSRI evaluations have been reduced by the FAA as more data supports the safety of this policy. Fielding an audience question about pilot self-assessment of fitness for flight, Salisbury replied, “There’s an old saying in medicine: ‘A doctor who treats himself has a fool for a patient.’” While all three physicians on the panel agreed with the value of pilots using the popular mnemonic aid, IMSAFE, to assess their fitness for flight, they cautioned against trying to self-diagnose conditions that could be potentially serious. Instead, they urged all pilots to develop a good relationship with their individual aviation medical examiner or aeromedical experts such as the ALPA Aeromedical Office. Snyder indicated that the ALPA Aeromedical Office receives many calls daily from pilots asking, “Can I take this medication and fly?” He explained, “Our initial response is not usually ‘Yes’ or ‘No’; it’s ‘Why are you taking the medication? What is the underlying condition?’ The underlying condition is more important than the medication itself.” Given that information, the pilot is given appropriate guidance on using the medication and flying.